© Liu Wei. Courtesy of Rubell Family Collection, Miami. Mera and Don Rubell, prominent art patrons of the Rubell Family Collection in Miami, visited China six times in the last ten years, looking for the best in Chinese contemporary art. Works by 28 of the talented artists they discovered are currently on exhibit at San Francisco’s Asian Art Museum through mid-August (and later in 2015 at the San Antonio Museum of Art). Creations on view are by brilliant modern artists, the oldest born in 1954, the youngest in 1986, although many have not previously shown their work in North America. Since most of us haven’t even heard of them before, one enters “28 Chinese” without preconceived notions. What one finds is the exciting sensory experience of viewing completely novel, sophisticated designs, that although rooted in China, possess a human spirit that transcends geography and culture. There are 48 pieces in all, in various media including painting, installation, photography and video. They are spread over the three floors of the Asian Art Museum. For example, it’s impossible to miss the main floor’s North Court, which has been transmuted by “Boat,” 2012, by Zhu Jinshi (b. 1954). It’s massive in dimension yet made of eight thousand sheets of light calligraphy paper, bamboo and cotton thread that give it an ethereal and delicate look. The artist explains that walking through the sound-deadened structure can “indefinitely extend every moment” and thereby expand time and space. In the striking oil on canvas, “Liberation No. 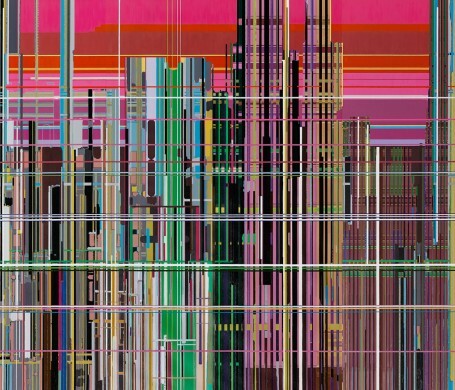 1,” 2013, Liu Wei (b. 1972) used software to generate patterns, which he then had painted with various colors, turning “pure logic into colors.” A universally applicable two-channel black and white video, “Kill (the) TV-Set,” 2012, by Yan Xing (b. 1986) shows a bonsai with the flashing words, “Kill (the) TV-Set.” Although it seems to stand on its own merit without the need for further explanation, the artist is actually imitating a 1965 performance of a 1955 John Cage presentation. As the exhibit continues on the second and third floors of the Asian Art Museum, the “28 Chinese” are interspersed with the Museum’s traditional works, providing fascinating links between ancient and modern. In his two pieces, Ai Weiwei (b. 1957) uses history to comment on the present day. “Ton of Tea,” 2005, is a compression of one ton of tea into a cube that resembles a piece of minimalist sculpture. 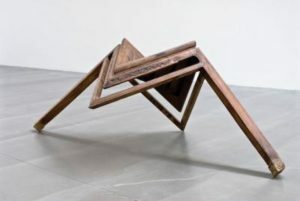 His “Table with Two Legs,” 2008 (above; © Ai Weiwei, courtesy of Rubell Family Collection, Miami), was a Qing dynasty table, taken apart and reconstructed to be seen in a dramatic new way. Please be careful as you enter the last room of the exhibit on the third floor, since one major piece is at ground level. Entitled “The Death of Marat,” 2011, by He Xiangyu (b. 1986), it is a lifelike work of important political commentary. The Rubells, an engaging and down-to-earth couple, explained at the press preview that, soon after their marriage (50 years ago), they started to collect new artists by saving $25 out of Mera’s teaching salary (Don was then in medical school and became an ob-gyn physician). They were early collectors of Jean-Michel Basquiat, Keith Haring and Jeff Koons. Their collection grew over the years, until in 1989, their funds were augmented by an inheritance from Don’s brother, Steve Rubell, who, with Ian Schrager, had founded the New York nightclub Studio 54 and a hotel empire. Today the Rubell Family Collection in Miami is one of the world’s largest, privately owned contemporary art collections and is open to the public for guided tours two days per week. It must have been extremely difficult for the Rubells to select the few pieces for this vital show. They explained that, during their first trip to China in 2001, most Chinese art was geared to the export market. By 2005-6, many artists had begun to use their talents to express political and social issues within China. Certainly, the later pieces in the show articulate more overt views. Yet, this exhibit also presents new aspects of Chinese artists’ humanity and sensibility, as well as their continuing connection to ancient works. I highly recommend it. Emily S. Mendel 2015 © All Rights Reserved.